Will you lose weight and keep it off if you diet? No, probably not, UCLA researchers report in the April issue of American Psychologist, the journal of the American Psychological Association. Mann and her co-authors conducted the most comprehensive and rigorous analysis of diet studies, analyzing 31 long-term studies. People on diets typically lose 5 to 10 percent of their starting weight in the first six months, the researchers found. However, at least one-third to two-thirds of people on diets regain more weight than they lost within four or five years, and the true number may well be significantly higher, they said. “Although the findings reported give a bleak picture of the effectiveness of diets, there are reasons why the actual effectiveness of diets is even worse,” Mann said. Mann said that certain factors biased the diet studies to make them appear more effective than they really were. For one, many participants self-reported their weight by phone or mail rather than having their weight measured on a scale by an impartial source. Also, the studies have very low follow-up rates — eight of the studies had follow-up rates lower than 50 percent, and those who responded may not have been representative of the entire group, since people who gain back large amounts of weight are generally unlikely to show up for follow-up tests, Mann said. “Several studies indicate that dieting is actually a consistent predictor of future weight gain,” said Janet Tomiyama, a UCLA graduate student of psychology and co-author of the study. One study found that both men and women who participated in formal weight-loss programs gained significantly more weight over a two-year period than those who had not participated in a weight-loss program, she said. Another study, which examined a variety of lifestyle factors and their relationship to changes in weight in more than 19,000 healthy older men over a four-year period, found that “one of the best predictors of weight gain over the four years was having lost weight on a diet at some point during the years before the study started,” Tomiyama said. In several studies, people in control groups who did not diet were not that much worse off — and in many cases were better off — than those who did diet, she said. If dieting doesn’t work, what does? Diet studies of less than two years are too short to show whether dieters have regained the weight they lost, Mann said. “Even when you follow dieters four years, they’re still regaining weight,” she said. One study of dieting obese patients followed them for varying lengths of time. Among those who were followed for fewer than two years, 23 percent gained back more weight than they had lost, while of those who were followed for at least two years, 83 percent gained back more weight than they had lost, Mann said. One study found that 50 percent of dieters weighed more than 11 pounds over their starting weight five years after the diet, she said. Evidence suggests that repeatedly losing and gaining weight is linked to cardiovascular disease, stroke, diabetes and altered immune function. Mann and Tomiyama recommend that more research be conducted on the health effects of losing and gaining weight, noting that scientists do not fully understand how such weight cycling leads to adverse health effects. Mann notes that her mother has tried different diets, and has not succeeded in keeping the weight off. “My mother has been on diets and says what we are saying is obvious,” she said. While the researchers analyzed 31 dieting studies, they have not evaluated specific diets. Medicare raised the issue of whether obesity is an illness, deleting the words “Obesity is not considered an illness” from its coverage regulations in 2004. The move may open the door for Medicare to consider funding treatments for obesity, Mann noted. From 1980 to 2000, the percentage of Americans who were obese more than doubled, from 15 percent to 31 percent of the population, Mann noted. A social psychologist, Mann, taught a UCLA graduate seminar on the psychology of eating four years ago. She and her students continued the research when the course ended. Mann’s co-authors are Erika Westling, Ann-Marie Lew, Barbra Samuels and Jason Chatman. “We asked what evidence is there that dieting works in the long term, and found that the evidence shows the opposite” Tomiyama said. The research was partially supported by the National Institute of Mental Health. In future research, Mann is interested in studying whether a combination of diet and exercise is more effective than exercise alone. UCLA is California’s largest university, with an enrollment of nearly 37,000 undergraduate and graduate students. The UCLA College of Letters and Science and the university’s11 professional schools feature renowned faculty and offer more than 300 degree programs and majors. UCLA is a national and international leader in the breadth and quality of its academic, research, health care, cultural, continuing education and athletic programs. Four alumni and five faculty have been awarded the Nobel Prize. 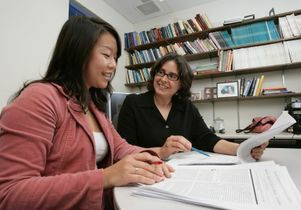 UCLA psychologists Traci Mann (right) and Janet Tomiyama analyzed 31 long-term studies on dieting.